You may have noticed this interesting badge in my sidebar for the last few weeks. Read More, Give More? I Dig Reading Challenge? What's this all about? 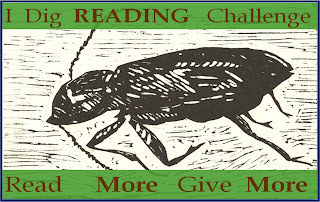 KO of The Insect Collector knows that we're all readers, so she came up with the brilliant idea of tying in charitable donations with how many books we read that month. It can be as much or as little as you want. You can give a penny a book, or a penny a page. A dollar a book. Five dollars per book. Your choice. The beauty of her I Dig Reading Challenge is that YOU choose both how much to give and what charity it give it to! You can also choose whether to tell the world or to keep it to yourself if you prefer. I pledged to give $5 per book. Last month I read 11 books and gave the money to a brain aneurysm cause. This month, I've read 12 books and I'm giving to Shelterbox for Japan. But it's entirely up to you. No pressure. If you'd like to participate, hop on over to Katharine's blog and copy the cool bug badge she created (after all, her blog is called The Insect Collector). Just give her credit! Then sign up with her if you wish (there's a tab at the top), keep track of what you read, and pledge to give a set amount of money for every book you read in 2011. (And it's never too late to sign up -- I didn't start until February). With the disaster in Japan this month, the New Zealand crisis in February, the ongoing problems in Haiti, and many other situations both around the world and close to home, isn't this the time to give money? And what better way to do it than by keeping track of how many books you read. Now that's what I call multi-tasking. 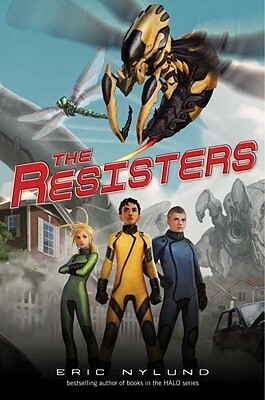 THE RESISTERS by Eric Nylund, coming April 26, 2011 from Random House, for ages 10 to 14. No magic here (well, maybe a little), but plenty of neat inventions and non-stop excitement. Ethan Blackwood is the star of his soccer team. But this isn't just any soccer team. When he plays soccer, he plays it inside a 600-pound nuclear-generated exoskeleton. Twelve-year-old Ethan lives far in the future, after World War Four, when the world is at peace and everyone speaks the same language. Kids compete for spots in the top high schools. As soon as they become teens, they're whisked off to these prep schools. Ethan has never questioned this. 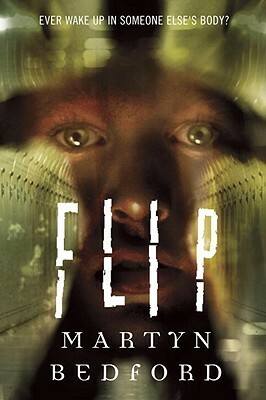 But after his soccer game, Ethan is dragged away by two pale kids, Felix and Madison, who don't go to his elementary school. They take him to a secret cave and show him three fighting suits that look like insects. And they tell him an incredible story: fifty years ago Earth was taken over by the Ch'zar collective, an alien civilization that uses mind-control. Everyone over the age of 13 is controlled by the Ch'zar. For some reason, their mind control techniques don't work on kids. Felix and Madison then ask Ethan to join them, using the flying wasp suit, and become a Resister. Will Ethan accept the challenge? Will he be able to handle it? And what will happen to his thirteen-year-old sister, Emma, who's heading for prep school tomorrow? What about his parents, who always tried to tell him to think for himself? This is like a video game come to life (no surprise, considering the author is a head writer for Microsoft Game Studios and is best known for the HALO series). Action-packed and highly entertaining. I think you'd enjoy it. Marvelous Middle Grade Monday is the brainchild of Shannon Whitney Messenger at Ramblings of a Wannabe Scribe. Today she's featuring three different MG books -- and a giveaway! Go see what they're up to this week. UPDATE: Natalie Aguirre at Literary Rambles is featuring a giveaway also! Don't forget my GIVEAWAY! Still going on, until Sun April 3. 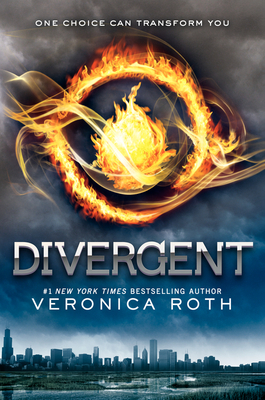 Win an ARC of DIVERGENT by Veronica Roth. Be a follower, leave a comment on that post. Creative answers to my question (which faction in DIVERGENT would you join?) have a better chance of winning! What would you do if you had to face your worst fears? In DIVERGENT, by Veronica Roth (coming May 3, 2011 from Katherine Tegen Books/HarperCollins, for ages 14 and up), sixteen-year-old Tris is forced to confront her ultimate nightmares in a series of simulations. Will they break her or make her stronger? DIVERGENT is -- are you ready for this?-- better than THE HUNGER GAMES (*shields face from flaming arrows hurled by bloggers*). Don't get me wrong. I love them both. And there are obvious similarities here. A strong female protagonist. First person present tense narration. A futuristic dystopian world, with a corrupt government. Lots of violence, but never gratuitous. And both novels are positively addictive reads. But DIVERGENT is richer, deeper, and more complex. I'm in awe of Veronica Roth's abilities as a writer. The unusual first line drew me in, and I was hooked. The pacing is perfect, the dialogue is realistic, the character growth is amazing. Tris blossoms into a real person long before you finish the book. You'll be so caught up in this amazing novel, you'll become Tris. There are myriad secondary characters, yet I never got them confused. The training process for the faction Tris chooses is long and arduous and yet utterly fascinating because it's both physical and psychological. Fear takes a front seat in this novel. And I have to admit the love story is more satisfying. I've said before that I never thought the romance was an important part of THE HUNGER GAMES trilogy. Here it's so tightly entwined with the action, the intrigue, the fear and the fighting, you only realize long into the book that you're completely invested in the romance too. The stunning world Veronica Roth has created is one in which personality traits determine one's future. Beatrice (Tris) lives in a future version of Chicago, where Lake Michigan is nothing but a marsh, and the people live in separate factions. The five factions were created decades before the story opens, when people realized it wasn't race or religious belief or nationalism that caused war, but faults in human personality and humankind's natural tendency toward evil. Will the factions continue to live together in harmony or will war break out? Now that Tris is sixteen she has to choose her faction at the Choosing ceremony. She's been raised by Abnegation parents, but she's not obligated to choose Abnegation. The simulation test all sixteen-year-olds take before the ceremony is supposed to show them which faction would suit them best. For Tris, the results are surprising. Will she choose Abnegation, Candor, Erudite, Amity, or Dauntless? And what deadly secret is she hiding? Once you choose your faction, you live with them from then on, even if it's not the faction in which you were raised (you'd leave your own family behind). If you can't choose or you're kicked out of your faction, you become factionless, similar to the homeless people in our cities today. You learn all of this in the first two chapters of the book and there are thirty-seven more chapters (note that I read the ARC). To say any more would reveal too much and I would never want to do that. This book is too important to spoil. Read it for yourself. In fact, I love this book so much I'm willing to give away my ARC. Which faction would you choose? Abnegation is all about selflessness (giving up your seat on the bus), Amity is all about friendliness and kindness (they make good caregivers), Erudite is for people who love to study or teach (they also become librarians), Candor is for the unfailingly honest (they always say what they think), and Dauntless is for the brave (the kind of people who like bungee-jumping off buildings). If you can't decide, then you can always choose factionless. But where's the fun in that? I'll choose the most interesting answer. (Hey, my blog, my rules!) Be creative! Knock my socks off! 1) One copy goes to the most original and creative answer to the question (see above). 2) The second copy goes to a random winner. This giveaway closes at 11:59 pm EDT on Sunday April 3. I'll announce the two winners no later than Wednesday, April 6. Good luck! UPDATE: CONTEST CLOSED! Sorry to anyone who tried to comment after midnight last night! I've now turned off comments. As I've mentioned before, quiet books are often overlooked. 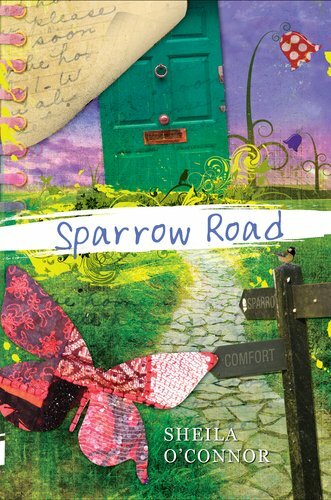 SPARROW ROAD by Sheila O'Connor (Coming from Putnam May 12, 2011, for ages 8 to 12) is one quiet book you'll want to add to your TBR list because it's a rich and rewarding read. Raine is 12 the summer that Mama abruptly decides to take a job as cook and housekeeper for an artist colony out in the country called Sparrow Road. She insists that Raine spend the summer at the colony with her instead of staying in Milwaukee with Grandpa Mac. But at the same time, Mama won't let her go anywhere, especially into the town of Comfort. What is Mama hiding? There are secrets at Sparrow Road, and one of them involves Raine's own past. The colony is a sprawling estate with a meadow, a pond, artist sheds, and a dilapidated mansion that was once an orphanage. The dusty attic is still filled with narrow metal beds. City-girl Raine gradually gets used to the quiet of the country and also gets to know the four artists-in-residence: stern Eleanor, energetic Josie, friendly Diego and timid old Lillian, who may have a connection to the old orphanage. There is no TV at Sparrow Road, so Raine is bored until Josie convinces her to work on her own form of art and write a story about the orphans who once lived here. Raine is a wonderful character, well-rounded, thoughtful and always real. This is a rare book in which the main character is a child but all the secondary characters are adults. How Raine interacts with them and discovers her creative side makes for a lovely, touching story. The mystery of Raine's own past adds a layer of intrigue. And the subplot involving Lillian brought tears to my eyes. This is a book about love and forgiveness and coming to terms with the past. What quiet middle-grade books have you enjoyed? 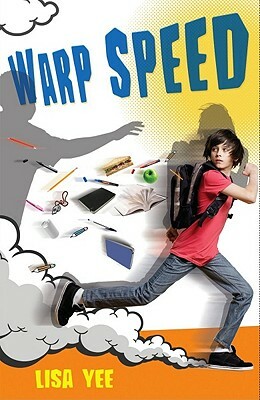 Marvelous Middle Grade Monday is the brainchild of Shannon Whitney Messenger. Today she's giving away a signed copy of A WHOLE NOTHER STORY! Shannon O'Donnell is back and discussing THE PRINCESS AND THE GOBLIN. Myrna Foster is featuring THE ADVENTURES OF DANIEL BOOM AKA LOUD BOY! And Brooke Favero showcases THE CLOCKWORK THREE. Hop on over to their blogs. UPDATE: Sherrie Petersen has an interview with Kekla Magoon, featuring her new MG book, CAMO GIRL. 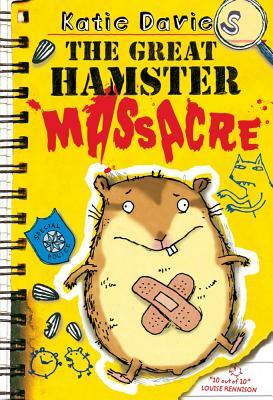 Coming May 3, 2011 from Beach Lane Books/Simon & Schuster: THE GREAT HAMSTER MASSACRE by Katie Davies, for ages 8 to 12. With the word "massacre" in the title, you might not expect this to be funny. Written as nine-year-old Anna's "What I Did On My Summer Vacation" essay, this is a breezy, hilarious, and touching British comedy of errors. I laughed out loud more than a few times. And the drawings by Hannah Shaw are terrific and very kid-like. Anna and her little brother Tom desperately want a hamster. Of course, their parents say no. Anna's friend and next-door-neighbor, Suzanne, tries to help them in their quest for a hamster. But the parents don't give in until something else happens (I won't spoil that part of the plot). Mum even agrees to buy two hamsters, which the pet shop man swears are both female. But once the babies arrive, there's a tragedy. (Well, duh, the title has already clued you in). But after that, the already-fast pace really picks up as Anna and Suzanne, aided (hindered?) by Tom, start an Investigation into the Incident, complete with a digital recorder, a notebook, a magnifying glass and a list of rather colorful suspects. Thanks to my awesome sales rep, Tim Hepp, I have both a bound manuscript of the British version of THE GREAT HAMSTER MASSACRE (published in 2010) and an ARC of the "Americanized" version. And I must say, Simon & Schuster, you should trust your readers to understand. Kids are smart. They'll figure out what a tyre is. Biscuit sounds way more interesting than cookie. And "Tom needed a wee" is even funnier than "Tom needed to pee." See? I'll bet you're laughing already. Marvelous Middle Grade Monday was created by the inimitable Shannon Whitney Messenger. She's back to posting about MMGM today! Yay! Hurry on over there because she's giving away a signed ARC. Our Second In Command is Shannon O'Donnell. I wish her well and hope she gets back to her regular MMGM posts next week. Others who regularly post MMGM reviews: Myrna Foster, Ben Langhinrichs, Brooke Favero, Sherrie Petersen. Go see what they're up to today! Interestingly, Ben is reviewing a book that I reviewed here. UPDATE: Kimberley Griffiths Little (a published MG and YA author!) has joined the ranks! What middle grade marvels have you read recently? And do you think 8-year-old American kids would like a book with all the British-isms intact? Okay, so I just realized I've posted middle grade reviews four weeks in a row, without any YA book reviews in between. I've been busy writing and of course editing, but I'm always reading too. So it's time to play catch-up and tell you about some great YA novels. 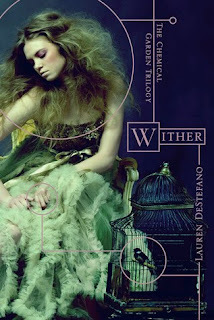 Wither by Lauren DeStefano (Simon & Schuster, on sale March 22, 2011, for ages 14 and up). I worried that this would be too depressing. I needn't have worried so much. Sure, it's an intense subject -- in a bleak and dangerous future, 16-year-old Rhine is kidnapped and sold into a polygamous marriage with a wealthy young man in Florida -- but I found myself so caught up in Rhine's voice and the smooth present-tense narration, that I was hooked before I realized it. The mood is relentless. And I admire Lauren Destefano's world-building. Her hand never falters. If you can accept the premise that a virus is killing off all the girls at age 20 and the boys at age 25, then you'll have no problem with the rest of this dark and sensuous story. Rhine is a bird in a golden cage, given fabulous clothes, delicious food, and beautiful gardens to wander in. And Linden, her husband, never forces himself on her. But she's still a prisoner. She finds a friend in Gabriel, one of the servants. She grows to love her sister-wives. But she still misses her twin brother back in New York. And like Dorothy in Oz, all she wants to do is go home. Admit it, you know you want to read this one. Strings Attached by Judy Blundell (Scholastic, March 1, 2011, for ages 13 and up). Stunning historical fiction set in 1950. Kit Corrigan is a triplet. As children, The Corrigan Three were exploited by their widowed father for diaper and baby formula money. When they grew up, Jamie and Muddie tired of singing and dancing in local ads, but Kit was hooked. As the story opens, she leaves her siblings, her father, and her soldier boyfriend, Billy (who's about to go to Korea) in Rhode Island and heads to New York City to make it big in show business. She's 17. She manages to find a job as a chorus girl. But she can't afford an apartment. That's when Nate Benedict, Billy's father, offers her one for free. Are there strings attached? Everyone else thinks so. But Kit is innocent. Even a little naive. Then there's a murder at the nightclub, a mob-murder that Nate Benedict may be connected to. And suddenly Kit is in over her head. Although it's not an easy read (chapters go back and forth in time and you really must pay attention), this mystery has a classy, noir feel, similar to What I Saw and How I Lied, Blundell's previous YA novel. These books remind me of Bogart and Bacall movies. 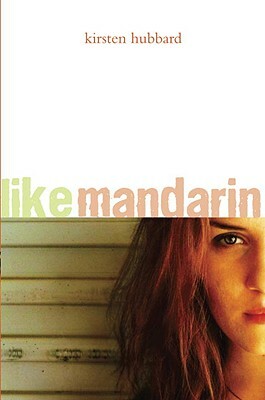 Like Mandarin by Kirsten Hubbard (Delacorte Press, March 8, 2011, for ages 14 and up). Would you be truly happy if you were someone else? Or somewhere else? Everyone in Grace Carpenter's small-town high school wants to be like Mandarin Ramey. She's beautiful. And she's a free spirit who does exactly what she wants. The rumor is that she sleeps around with older men. Everyone is in awe of her. A smart, unpopular girl like Grace could never be friends with Mandarin. Or could she? When a teacher assigns Grace to help Mandarin figure out her senior service project, Grace discovers a Mandarin that none of the other kids see. Mandarin loves beauty and nature, and dreams of getting out of their tiny Wyoming town and being famous. An unlikely friendship blossoms and the two girls make a pact to run away. But Grace worries that Mandarin isn't telling her the truth. A searingly honest look at high school friendships and betrayal and learning to like yourself before you can like anyone else. Exquisite detail makes you feel you're right there in Wyoming, with the wildwinds and the dust. Serious in tone, with occasional flashes of humor, this is definitely worth reading. What YA books are you looking forward to reading this spring? Which ones have you read recently that you absolutely love?